Hicham Aboutaam of Phoenix Ancient Art, New York City and Geneva, featured this early Second Century BCE marble sculpture depicting the young Dionysus trouncing a panther. The circa 550-500 BCE black-figure neck amphorae, left and right, are also decorated with Dionysian scenes. 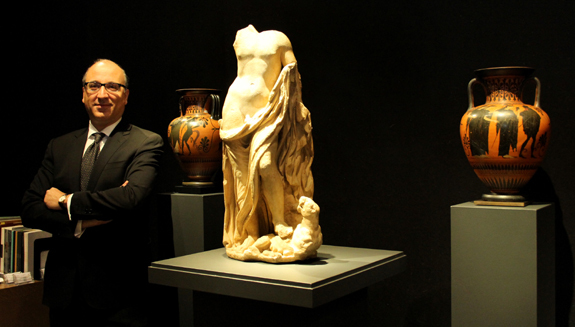 There is nothing like its Berkeley Square location, said Hicham Aboutaam, fresh from the October 3-9 PAD London Art + Design show, where Phoenix Ancient Art sold 13 pieces. In New York, Aboutaam’s impeccable display showcased an early Second Century BCE marble sculpture depicting the young Dionysus trouncing a panther, black-figure Attic amphorae and ancient Etruscan gold and agate jewelry.